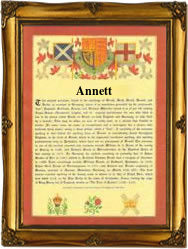 This interesting surname, with variant spellings Annett, Annatt, Anetts, Annetts, Annott and Annis, is of early medieval English origin, and derives from the Middle English vernacular form of the female given name "Agnes". The name Agnes comes from the Greek word "hagnos", meaning pure or sacred, and was borne by an early Christian saint, a twelve-year-old Roman girl who was martyred for her Christian belief in the time of Diocletian. In early recordings the name was often written as Annis, Annice or Annes. One Annote Resthanbe was registered in Yorkshire in the year 1297. The surname was first recorded in the late 13th Century (see below), and early recordings of the variants include John Annot, who was registered in the Subsidy Rolls of Cambridgeshire in 1327. Recordings from London Church Registers include: the christening of Juidith, daughter of Nicholes Anite, on November 8th 1573, at St. Ann's, Blackfriars; the marriage of Henry Annett and Ann Ratlif on May 12th 1605, at St. Martin Pomeroy's; and the christening of Danyell, son of Henry Annett on October 19th 1606, also at St. Martin Pomeroy's. The first recorded spelling of the family name is shown to be that of Robert Anot, which was dated 1275, in the "Court Rolls of the Manor of Wakefield", Yorkshire, during the reign of King Edward 1, known as "The Hammer of the Scots", 1272 - 1307. Surnames became necessary when governments introduced personal taxation. In England this was known as Poll Tax. Throughout the centuries, surnames in every country have continued to "develop" often leading to astonishing variants of the original spelling.